When this story was first shared on Facebook several days ago, it immediately caught fire and easily generated more than 50,000 likes and has increased to more than 100,000 as of this writing. There are indeed significant reasons why this story of a cop captured the hearts of many Filipino netizens online. 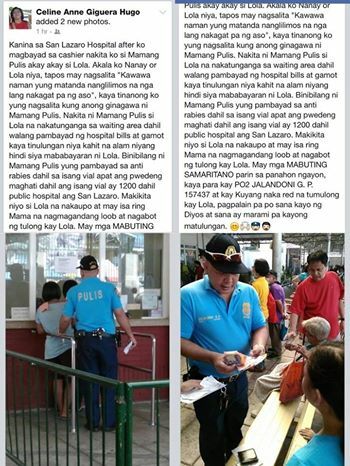 First, it is quite rare for Pinoys to read stories about good deeds from a cop like this. Second, as a former member of Special Action Force, memories about Mamasapano massacre were suddenly ignited and sharing this generous act is a salute in memory of the 44 SAF policemen who were massacred months ago this year. Now, we have more revelations from this story and PO2 George Jalandoni revealed more details about his good deed. He was also waiting for his turn for his anti-rabies shot when he noticed an elderly woman ignoring calls from hospital attendant that it was her turn to have the shot. Sensing that something is odd with the situation, he approached the old woman and found out the she too had to be injected with anti-rabies shot as she was bitten by a stray dog and that she had no money to pay for it. He only had P320.00 in his wallet so he decided to seek help from three other people who was in San Lazaro hospital at the same. He was able to generate P1,200 which was enough for the anti-rabies shot of the old woman who happened to be a beggar also. As soon as he was able to settle the old woman’s account, he immediately proceeded to the emergency section of the hospital to have his anti-rabies shot also. When he went back to where the old woman was supposed to be, she was no longer there and PO2 Jalandoni was not able to get her name and other important details for him to make a follow up. Jalando did not expect that his San Lazaro travails will fire up the Internet for him, he was just doing what was expected from him. He even made a call to the family of the old woman to take care of her and ensure that her next anti-rabies shot should be administered when it is time to do so. He received huge number of praises and his office, the Philippine National Police shared his story on its Facebook page. Probably, it is media’s fault that cops' image were tainted and that Filipinos embrace this kind of story easily as if a miracle has indeed happened. This story suggests that we should not make generalizations as there are indeed good cops out there, it just so happened that their stories were not shared. 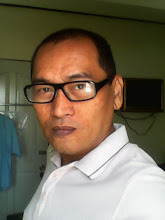 The second lesson is that, it is time for us to visit the PNP Facebook page and acquaint ourselves with their stories so that we know and will be confident that there are thousands of good cops out there instead of relying on TV shows and movies to describe them which are often on the negative side. The third lesson is that we are reminded to stop being cynical when it comes to cops. Let us give them the respect that their uniforms and badges deserve. We should not allow bad portrayals and impressions to rule over and ridicule them. Remember, you will never know when you need a policeman. The most important lesson here is that the PNP should publish more stories similar to this on their Facebook page. The Philippine National Police needs good PR if they want to win more people’s hearts and mind. They should also perform their own share of reminding people that PNP is teeming with good cops. This is not a bragging exercise but information sharing, it is for the lack of stories like this that PNP is losing in public relations war.